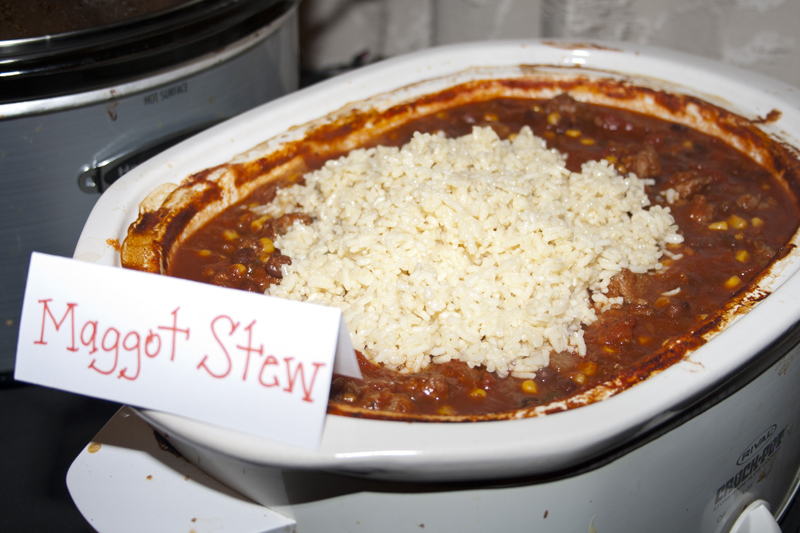 I make this chili frequently without the maggots too. It’s an easy dish you can just throw into a crock pot on a chilly fall day and enjoy with a chunk of french bread while watching the rain pour down your windows. Love this recipe idea? Check out more Halloween party food on my Fabulously Freaky Halloween Fodder post. It’s full of devilish and delicious ideas! Brown sausage. Add to crock pot along with all other ingredients. Simmer on low at least 4 hours and serve.To add the maggots, make 1 1/2 cups Minute Rice and toss finished rice with oil to make glisten. Dump into the middle of your chili.